Surveyors are the unsung pioneers of Australia’s land development. Scattered throughout rural areas lie remnants of their work, reminders of the origins of our nation. One such remnant is an old tree found in Namadgi National Park, which was used from 1915 to mark the newly created ACT/NSW border. Carved on the trunk of the mountain gum are the letters ‘CT’ (Capital Territory), ‘blazed’ by a team of surveyors including Harry Mouat. Mouat was among the first to survey the southwest border of the now Australian Capital Territory, encountering harsh terrain including cliffs, mountains, and snow in the alpine regions. Around 1,500 trees were marked to indicate the border, however only a few remain today, including Mouat’s tree. 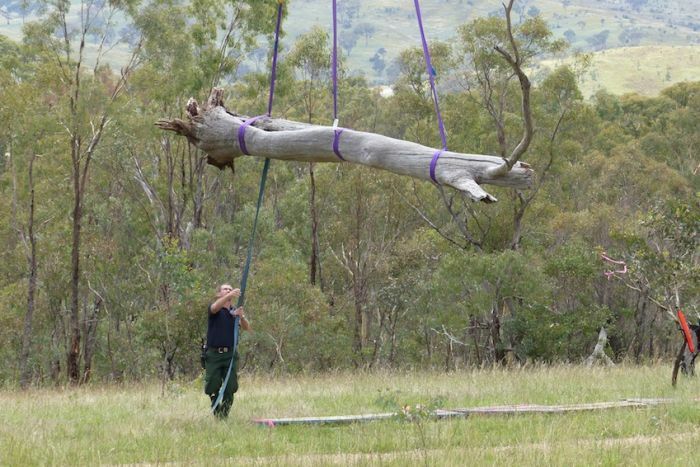 The fallen tree was airlifted from Namadgi National Park last week and will be relocated and preserved in the Namadgi Visitors’ Centre. It will be the centerpiece of a new display educating visitors about the impact of early surveyors on the development of the ACT. The Surveying and Spatial Sciences Institute has launched a fundraising campaign to raise $100,000 to build the exhibit. Parks and Conservation Service manager Brett McNamara said the expedition of early surveyors in the region is a story that needs to be told. “It’s a story that’s little known, in terms of why [Canberra] is located on the limestone plains,” Mr. McNamara said. “It’s because of the surveyors 100 years ago up there, etching out the water catchments that gave us the ACT-NSW border.